Going to Saturday’s game I was one of the many who was expecting a very tough encounter. Brentford have remained as contenders for the top six for the past few seasons. Working on a very limited budget in comparison to some of the division’s so called big teams, Dean Smith and his management team have worked wonders to keep them competitive in what’s regarded as one of the toughest divisions in Europe. Going 0-1 down in the opening minute seemed to confirm my fears that we had a very difficult task ahead. 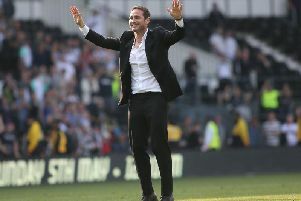 However, the response from the players was nothing short of magnificent and without exaggerating, that was the finest performance I have seen from a Derby County team in a very long while. The opening goal saw great work from Mason Mount, Craig Bryson and Harry Wilson. The second saw a cool finish by David Nugent and the third a brilliant free kick from Mount. For a good 89 minutes we were on top and never afforded our visitors any time to rest and regroup. More games like this and we can only achieve more results. Hopefully we can carry forward this display to our next series of games. If you were doing a match day ratings guide, no player would deserve less than an eight. Mount, Bryson and Bogle would possibly push for a nine. I’m not convinced we are anywhere near the finished article yet, so that should bode well if we build on it. If Frank Lampard can achieve success with this style of football in his rookie season, it would be an incredible achievement. He has built his own side and they are playing a completely different brand of football than under his predecessor. I suppose Lampard will be relishing the Tuesday night trip to Old Trafford to face his former boss Jose Mourinho. Although Mourinho will be expected to put out a second string side, make no mistake there will be plenty of talent, experience and flair about it. It would cap off a good week though if we could, this time, pull off a result. I suppose the headache for Lampard will be who to select and who to leave out. Personally I’d go with the same side that beat Brentford except maybe drop Nugent to the bench to keep him fresh for the league. Jack Marriott and Martyn Waghorn will be “champing at the bit” to be involved. Two expensive signings who have yet to get a run in the side because of the form of others. There’s an old saying, “If it isn’t broken, you don’t mend it” it should certainly apply to the current situation.